Back in October of 2008, I found a credenza on craigslist that I thought would be perfect for our large wall in our new kitchen. I had finished furniture before with my dad so I already had an idea what would work and what wouldn’t. FYI, make sure you take someone with you when you pick up stuff on craigslist! I took a guy friend of mine and I’m so glad I did – the place where we showed up wasn’t in a great part of town and I think I would have driven past and gone home if he hadn’t been with me. We stopped to look at the piece and I made sure all the drawers were in good condition and there was no water damage or loose wood. 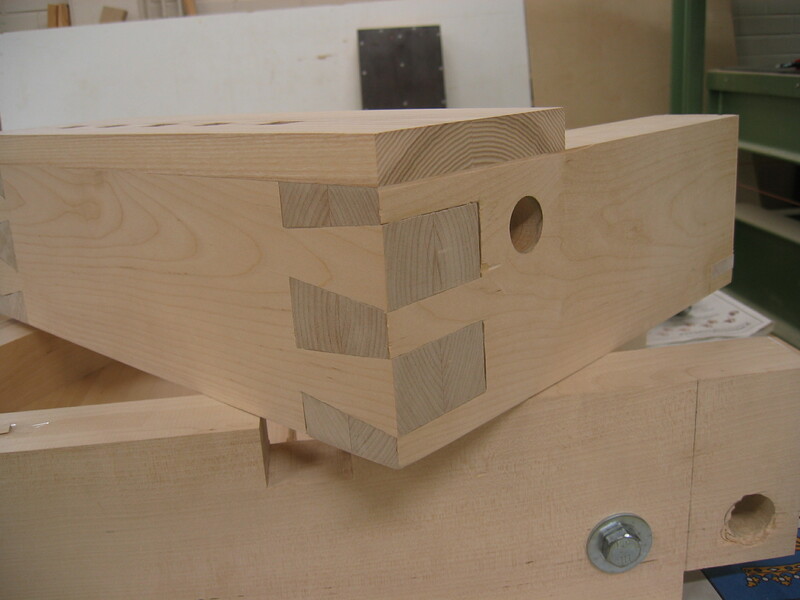 A good thing to look for in old (and well… new too) furniture is dovetailed joints. Also be sure to completely pull out drawers and look inside and in back of the unit. — Kilz Latex Interior/Exterior Water Based Paint – got white b/c I was painting the piece white anyway. — Several sheets of sandpaper. You can also try the blocks – they work well too and are a little easier to hold. Try buying a medium (around 80 grit), a fine (100 grit) and maybe another fine (120 grit). — Gloves!! Sandpaper’s awful on your hands. — A nice paintbrush – the brush makes the difference on how your painted surface will turn out. Try at least a 2inch wide one from the paint section. If your piece is smaller – you know the drill. — Water or oil based furniture paint. I get mine at Benjamin Moore – they usually have it towards the front of the store. Again, I got white but you can pick whatever you want! Also, I’ve worked with oil and water based… and unless you like dealing with the extra mess oil will get you – I’d go with the water based. Ok! Supplies bought and I was ready to start. You’ve heard it before – sand in a well ventilated area – preferably outside. Start with the 80 grit and sand with the grain of the wood. Do not sand across it or you’ll have these nice marks later when your paint settles. Trust me! Make sure to sand all surfaces to raise the grain of the wood to give the kilz something to adhere to. Now is the time to make edges rounded if you want or to disguise any chips in the piece by “softening” them with the sand paper. After you’ve sanded down the piece with the 80 grit, run that damp cloth (very very damp – almost dry) again over the sand paper to get rid of the extra dust. Take off your glove and run your hand over the piece to check and make sure you didn’t miss anything. Touch up spots that aren’t quite rough enough and then wipe again. Yes, then we have a little more sanding. Get your 100 grit and run it over the piece lightly to get rid of any large scratchy areas. Then wipe again. Ok kids, grab your paintbrush and the Kilz! Start on one section of the wood at a time. The object of the game is to coat one side at a time so you get seamless strokes. Again, follow the grain of the wood when you paint. Once you coat the entire side, run your paintbrush from one side of the grain to the other end – seaming your strokes together. Once your finished with that side, check for any drippy areas and them move on to the next side. I did about two coats of kilz and then three coats of my finishing paint. Leave plenty of time to dry – don’t get impatient and try painting over again – you’ll actually move the paint you just painted and get globs. Then you’ll have to wait and sand it again later. Also, use your fine 120 grit and sand down the piece after each coat of Kilnz. This ensures you’ll have a smoother finished piece. Below you can see the finished product with new hardware I bought at Home Depot Expo (sad they’re going under!) but you can get hardware online and or from other vendors. Some people coat their finished pieces with a clear coat. I haven’t done that yet on any of mine and I’ve had no problems. I’ll give it a go sometime in the future and see if I notice a difference. Thanks all! Credenza in it’s different stages. The bottom left is with 2 coats of Kilnz.